Hanukkah is Dec. 24, 2016 - Jan. 1, 2017. Dreidel, dreidel, dreidel... Check out our Holiday Music Specials and Christmas Editors' Picks as well. For more pieces about Jewish history and culture, take a look at our Jewish History Editors' Picks. Below are picks chosen by PRX editorial staff. 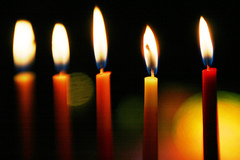 You can find other options for Hannukah by using our search. Two self-contained hours of special programming based on the acclaimed ten-part ATC series, with a Web site filled with photos, features, background, and sound at YiddishRadioProject.org. View Hour Two here. What happens to the children when Jews and Christians marry? An Open Gate looks at this question with humor and sensitivity. Jews and Christians speak about growing up within their faith and how intermarriage has redefined their perspective. Interfaith couples grapple with the challenge of celebrating holidays as a family as they attempt to instill a sense of religion, community and holiday spirit. This program also digs deep into the historical underpinnings of these two religions, exploring Jewish fears of Christian anti-Semitism and Christian desires to share Jesus' love with people they care about. "An Open Gate" is an hour-long audio documentary exploring the repercussions of a Jewish/Christian intermarriage on faith, identity and the family. Claire Schoen and Helen Stolzfus - CoProducers. Happy ChallaDAY! An original musical comedy for Hanukkah. Book, music and lyrics by Charles Moster. Inspired by the rather odd fact that the most famous Christmas song ever written, “White Christmas,” was composed by Irving Berlin, a Jew, Charles Moster has composed this light-hearted spoof parodying the old Bing Crosby/Danny Kaye movie “White Christmas.” General Waverlystein, retires from the Israeli army and opens a B&B on the Red Sea. Two of his old army entertainment corps buddies, now big stars known as the Sinai Schlamazels, join forces with the Schwartz Sisters to save his business by putting on a big holiday show. Profile of Flory Jagoda, an 83-year-old Sephardic folk singer from Sarajevo. Flory Jagoda grew up in a family of singers. Her childhood, in a mountain village outside of Sarajevo, was filled with songs, sung in Ladino - the language passed down by Jews expelled from Spain during the Inquisition - that told of the loves, lives and rituals of her community. With the horror of World War II, all that changed. She and her parents were the only survivors of the 42-member Altaras family. Since then, Jagoda, winner of a 2002 NEA National Heritage fellowship, has dedicated her professional life to composing, performing and teaching songs that preserve her memories of that lost life. Her songs, sung in Ladino, echo the Spanish and Bosnian melodies and rhythms of her past. This piece combines Jagoda's stories - told unflinchingly, and with humor and warmth - with music from her 4 recorded CDs. "La Nona Kanta" could air anytime, but might be especially appropriate during Hanukkah, as Jagoda is perhaps best known for what has now become something of a Hanukkah standard, her original composition, "Ocho Kandelikas." This piece was recorded and produced in 2007. Celebrating Chanukah in a dingy dorm lounge with an unlikely companion. Emma Cohen finds herself working on campus during the winter holidays, living in a dingy little room in your quintessential college dorm. For a practicing, but non-beliving Jew, Chanukah is a particularly important holiday for Emma. Its about tradition and ritual. But this winter, she doesn't go home. Instead, and by complete coincidence, she spends the festival of lights with Byron White. He's a big personality on campus, the kind of guy who's friends with everybody, but that nobody really knows. This is the story of their dorm-lounge Chanukah, and how they got to know each other. Every night, after the candles were lit, there was nothing to do but talk. As Jews around the world prepare to celebrate Hanukah, some in Boston are singing in Ladino, a language UNESCO rates as "severely endangered" in its 2009 Atlas of the World's Languages in Danger. Ladino has been traveling with the Jews since they were expelled from Spain in 1492. The endangered Ladino language, also called Judeo-Spanish, is a language without a country. Ladino has been traveling with the Jews since they were expelled from Spain by Ferdinand and Isabella in 1492. It has been kept alive in pockets of culture around the world, including Israel and Turkey, and some places in the U.S., such as New York, Florida and Seattle, Washington. Some universities in Israel have established programs on Sephardic culture and the Ladino language, but in the United States, the longest-running - and many say the only consistent - Ladino instruction at a university is by Professor Gloria Ascher at Tufts University in Medford, Massachusetts, near Boston. Ascher is Co-Chair of the Judaic Studies program at Tufts and initiated Ladino classes 10 years ago. Some students, professors and people from the community have studied up to four semesters of Ladino. Besides Ascher, others find Ladino calling to them. Vocalist Julia Madeson has performed many styles of music, and now performs Ladino with area musicians, some of them students at Berklee College of Music in Boston, where she is Coordinator of the Guitar Department. As Hanukah approachs and Jews prepare to commemorate the miracle of oil supposed to burn for one day -but lasting eight days - the singing of Ladino songs is also a reminder of the endurance of Jewish culture, despite the Jews' often forced scattering around the globe. As the candles of Hanukkah connect Jews around the world, holiday songs in Ladino shine a light on a language UNESCO rates as “severely endangered.” An increasing number of musicians in many countries are singing in this Judeo-Spanish language, which means it is no longer just your grandmother's Ladino. A growing number of musicians are discovering Ladino, also called Judeo-Spanish, a language in danger of dying, along with its elderly speakers. With musicians in the United States, Latin America and Israel singing, and even writing, songs in this Judeo-Spanish language, it is no longer just your grandmother’s Ladino. Ladino has become part of the soundscape of the Jewish musical revival and a recognized element of world music.